A grid-linked system feeds energy generated locally directly into a mains supply and therefore the grid network. With PV and small wind turbines this is done via an inverter. 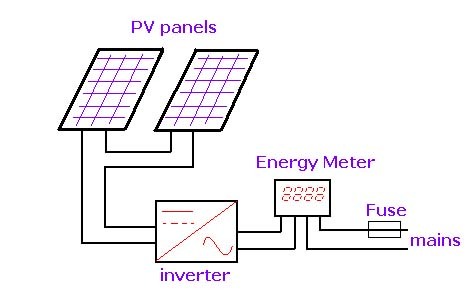 Grid-linked inverters are different from normal off-grid inverters. They are unable to supply power unless they can synchronise to a mains supply. These inverters must also comply with various standards to allow them to be connected to the mains supply. In the UK, there is a piece of legislation known as G83 for connections smaller than 16A per phase. There are a number of small inverters in mainland Europe which are designed to be plugged directly into the mains. Unfortunately these are not approved to be used in this manner in the UK. Some that are approved for UK use should be directly wired to a fuse in the consumer unit. One of the smallest approved units is the 600W Solidin which can form a costly installation with 600W of PV. It will work with lower wattages and I have managed to get reasonable performance with just 200W of PV panels. There are added risks associated with receiving DC shocks compared to AC: You may not be able to let go of a conductor! 1. 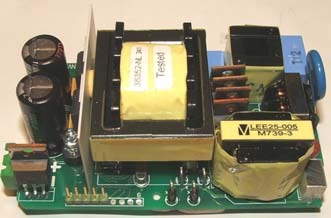 The DC voltage can produce very long hot arcs which may not rupture without suitably DC rated switches and fuses. 2. They cannot be switched off. If there is light assume it to be live. 3. In damp or wet weather there is an increase risk of shock. Even a minor shock can also lead to a fall when working above the ground. Smaller inverters, which look like a low voltage adapter are also available. These are very neat solutions to small grid-linking as they only require one or two PV panels and the inverter plugs into a socket. However, these are only approved in main land Europe. They will work in the UK but as the UK grid voltage can be higher than the rest of Europe, particularly if you live near a substation, the inverter may shut down with a "grid voltage too high error". A 'variac' or 230 - 250v transformer will sort this but the transformer losses make the benefit too small to be worth pursuing. 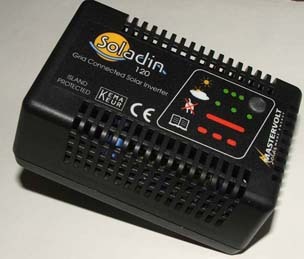 An example of a small mainland Europe mains adapter-sized grid-linked inverter is shown below. Inside the inverter is a switched-mode supply converting the DC supply from the PV panels to AC. The inverter attempts to increase the local voltage, very slightly, in time with the 50Hz supply. This results in a net current flow out of the inverter. Total generation for the period is 401.8kWh. This works out at almost 100W/h during day light from our 600W peak output system.